BIODYNAMICS is a dynamic, ISO certified, privately held company, its focus being the presentation of highly innovative Scientific Laboratory Instruments, Equipment, Reagents/Diag- nostics and Disposables. Biodynamics directly addresses the Markets of Greece and Cyprus through its own sales force, and builds on long-term cooperation with international suppliers, as Agent/Disributor. With its 35 year presence in the market, Biodynamics carries an excellent reputation and shares very close relationships with its customers. It is trusted for its experience, expertise and customer support, and recognized as a Total Solutions provider. Biodynamics was established in 1978 under the name K+Z, Technical and Commercial Enterprises Inc. 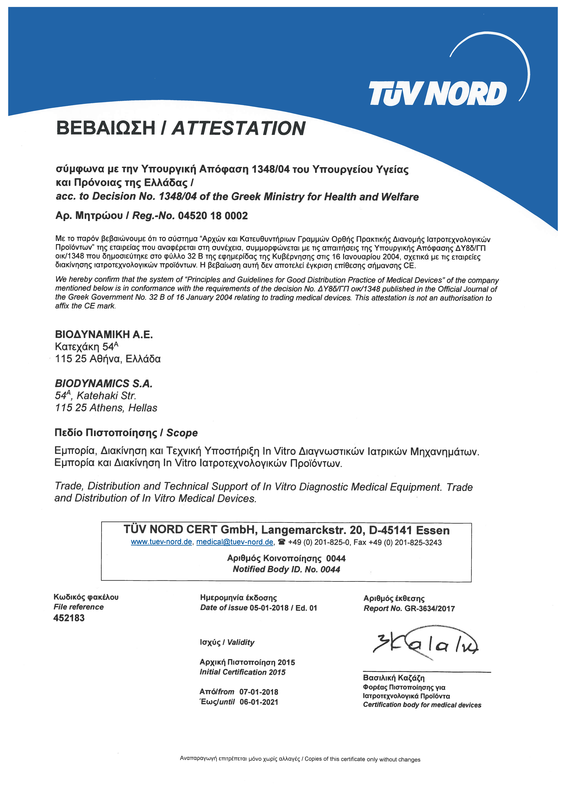 Focused in the introduction of novel/high-tech Scientific Laboratory Equipment, Reagents/Diagnostics and Consumables to the Greek and Cyprus Markets, it invests in long-term cooperation with international and local suppliers. Today Biodynamics is a leading distributor in the Anatomical Pathology market, providing Total Solutions in Histology, while having a strong presence in Cytology, Immunology, Molecular Biology, and Virology. It is a supplier of all major Greek Laboratories (Clinical, Academic, and Research) and has excellent long-lasting (for nearly 35 years) relationships with its significant customer base. 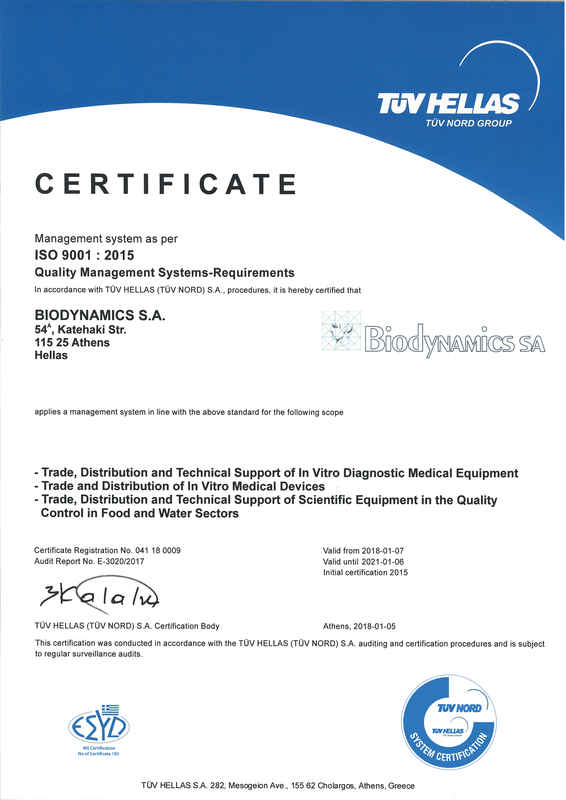 Since 1999, Biodynamics is ISO 9001:2008 and ISO 13485:2003 certified by the National Evaluation Centre of Quality & Technology in Health, and maintains a rigorous quality system for product inspection, purchasing, inventory management, invoicing and delivery, technical service, and complaints handling. • 500m² warehouse, cold room refrigeration facilities, and deep freeze storage with continuous temperature monitoring and uninterruptable power supply. • Very well organized technical service facilities with appropriate testing and repair facilities, spare parts inventory and laboratory area. • Presentation and Event facilities. Prompt deliveries to customers are ensured through company-owned distribution vans and the operations of Biodynamics are further supported by the integrated Information System (ERP) which enhances traceability and delivers superior management intelligence. At Biodynamics the technical support and service team offers nation-wide technical support and service by factory trained engineers on all instrumentation. Ongoing factory training ensures their ability to provide efficient and effective assistance to existing and prospective users. Biodynamics technical service promotes the use of service contracts as it has proven the benefit of preventative maintenance in minimizing down-time, in particular when dealing with large complex instrumentation. With a service contract customers enjoy peace of mind that instrumentation is kept in excellent working order and that work flow is seldom interrupted due to technical faults. In most instances, on-site service and repairs are done, thus minimizing customer down time. Biodynamics Technical Service however also boasts an extensive in-house workshop and laboratory consisting of all the necessary specialized tools and equipment needed for complex repairs or trouble shooting, ensuring that instruments are kept working according to specification. All service and repair work is guaranteed, with only the original manufacturer spare parts being used. For all technical and service related questions, telephonic consulting is available from the Central offices. This prompt communication often allows for quick resolution of minor problems and queries. We are always looking out to further invest our organization, expertise and resources in promoting technologically superior solutions from innovative, customer-focused and quality-driven suppliers. Copyright © 2017. 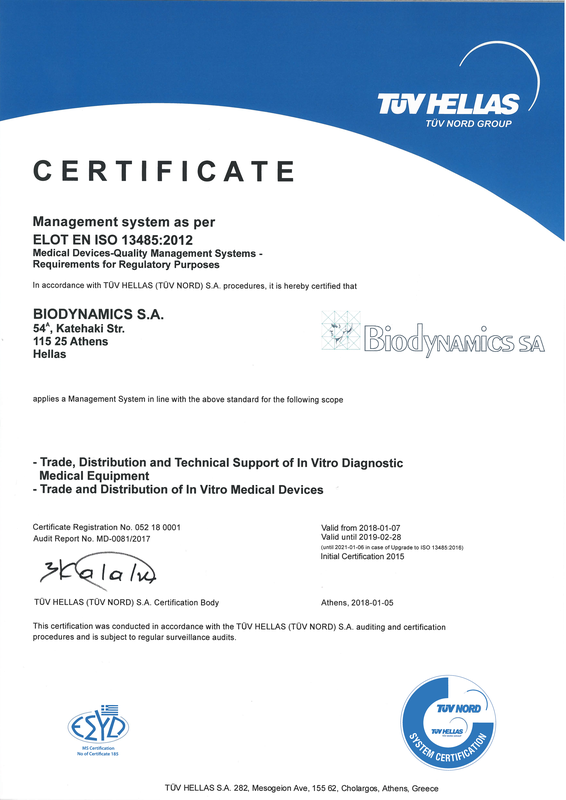 BIODYNAMICS SA, Katehaki 54A, Athens, 115 25, Greece. All rights reserved.